Robotic gynaecology is a very precise way of performing gynaecological operations. The da Vinci robot, made by an American company, Intuitive Surgical, has enabled surgeons to perform operations robotically. It is a way of carrying out minimally invasive surgery with the robot performing the surgery, whilst being controlled by the gynaecological surgeon at a 'console'. 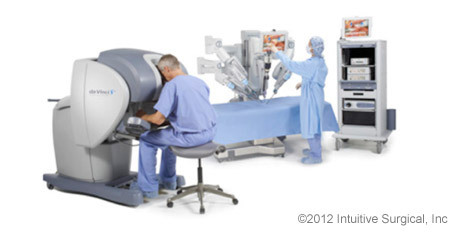 In the USA robotic surgery has evolved rapidly because of the surgical benefits and it is now becoming available in the UK in a small number of hospitals that have invested in a da Vinci robot. Robotic gynaecology gives the patient all the advantages of laparoscopic (minimal access surgery): small, cosmetic incisions, less post-operative pain, reduced risk of infection, a reduced hospital stay and a quicker return to normal activities. 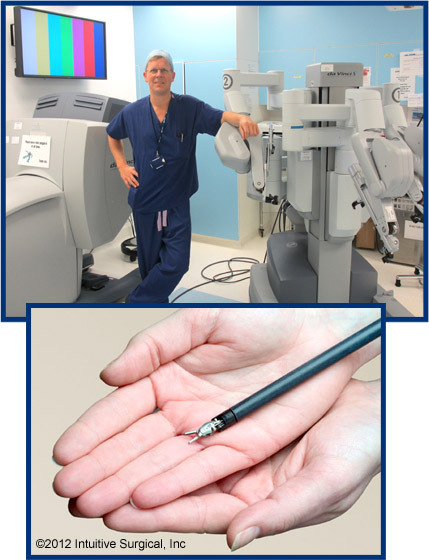 Robotic surgery is particularly advantageous for overweight patients. It enables the surgeon to have a good operating view and it reduces the postoperative complications associated with obesity. There are some women for whom robotic surgery may not be suitable, for example in women with previous multiple abdominal operations. Robotic gynaecology gives the surgeon the advantage of a three-dimensional (3-D), high-definition view, the control of the camera and three robotic ‘arms’. 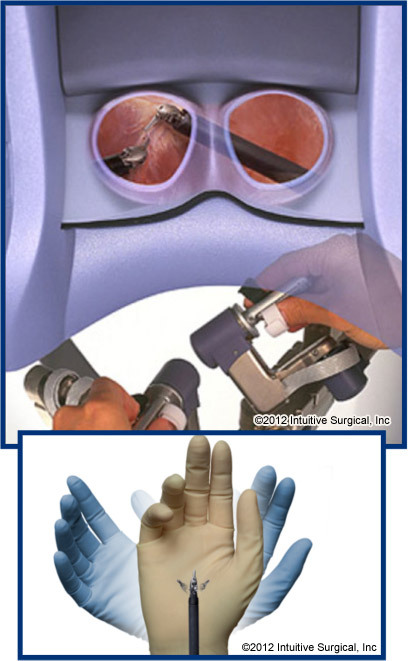 The instruments are all articulated with a robotic wrist, which precisely mimics the surgeon’s movements. The surgeon also suffers less fatigue compared to laparoscopic surgery because they are comfortably seated at the console. Nick Elkington was already a very accomplished laparoscopic (keyhole) gynaecological surgeon before training in robotic surgery. He trained extensively in laparoscopic surgery as a specialist registrar in the United Kingdom before gaining a prestigious laparoscopic fellowship at Sydney Women’s Endosurgery Centre in Sydney, Australia. At Frimley Park Hospital he introduced advanced laparoscopic surgical procedures such as total laparoscopic hysterectomy, laparoscopic excision of endometriosis, laparoscopic myomectomy (removal of fibroids) and laparoscopic pelvic floor repair. After establishing a laparoscopic service at Frimley park hospital in Surrey, he trained in robotic gynaecology surgery at the European Institute of Telesurgery in Strasbourg, France in 2009. Since then he has become and accredited da Vinci robotic gynaecology surgeon with Intuitive surgical. The gynaecological operations suited for robotic gynaecology surgery include: robotic hysterectomy, robotic myomectomy (removal of fibroids), robotic excision of endometriosis and robotic sacrocolpopexy (treatment of vaginal vault prolapse). Many gynaecological operations can more simply be achieved with laparoscopic (keyhole) surgery rather than employing the use of the da Vinci robot. Some gynaecological cancer operations (uterine, cervical and some ovarian) are also suitable for robotic gynaecology surgery, however, Mr Elkington is a benign gynaecologist and refers cancer patients on to a gynae-oncolgy surgeon. Robotic gynaecology surgery is particularly beneficial for obese patients. This is because during the robotic surgery, the surgeon has an excellent view of the patient’s pelvic anatomy. Patients then benefit from improved wound healing as they avoid the problems associated with large abdominal incisions in obese patients.